When the country has allocated Rs.59million to send its delegation to Geneva in March 2013 to defend the country against mounting human rights allegations the simple question is why has it been so difficult to defend the country against terrorists – banned by the very nations making the allegations? Why has it been difficult for official representatives to derive a strategy that clearly provides with documentary proof what LTTE did over 30 years (both at home and abroad) and what the Government has been doing post-war to uplift the lives of people in areas that the LTTE terrorists held owing in large measure to a bogus cease fire agreement that was heralded by some nations of the so called international community. Having said that a question every member of the general public is asking themselves is who is out to rob the victory sacrificed by Sri Lanka’s ranaviruwan for in their eyes the key people tasked to steer the foreign policy do not have the respect or reputation to be tasked with such a strategic and important role. The Government cannot afford to ignore these warnings in the light of mounting failures Sri Lanka is unnecessarily experiencing primarily as a result of inexperienced negotiators without courtroom experience and only academic qualifications with negotiating skills that equal appeasement tasked to decide Sri Lanka’s fate which due to their treacherous past will eventually decide the fate of the leaders of the country as well. The accusation by UNP MP Sajith Premadasa on the Governments double speak policy is noteworthy in the context of trying to determine what Sri Lanka has done wrong to defend itself in Geneva and if for lack of defense the chosen option is to simply agree to launch Commissions simply to buy time and keep the accusers silent? Sajith Premadasa has accused the Foreign Minister of giving undertakings to the international community to investigate allegations of human rights violations and to address accountability issues on more than one occasion. Is this why the international community is now demanding answers? Sajith Premadasa is also accusing the foreign minister of signing joint communiqués with the UN Secretary General and even gone to the extent of pledging implementation of the 13th amendment plus and the public would also like to know who has given the Minister the mandate to speak of devolving power beyond what the Constitution provided. We ask this question specifically because as a devolutionist he is ideologically prone towards division as clearly revealed in his proposal for a Union of Regions and the manner in which he despite all his educational upbringing watched the implementation of the ceasefire agreement placing terrorists on par with a democratic state, government and armed forces while drafting new constitution omitting the place of Buddhism in an attempt to denationalize the majority populace. It was this same person who belittled the victory of our heroes for his response to the victory of the armed forces was given in philosophical terms that there were ‘no victors in war’ – this is not what we expect of a person who is paid to defend the nation and enjoying foreign trips around the world at the expense of the tax payer. This is the same person whose Ministry website continues to totally ignore the injustices of the colonial rulers upon the majority populace by placing his personal ideology as that of the State “Reflecting on it, a fair verdict on British rule would be that while, like all alien regimes it had its drawbacks and limitations, especially in the economic and cultural areas, these were balanced, if not outweighed, by positive contributions on the political side which were primarily, the peace which the British regime brought”. Much of the worries that the public of Sri Lanka share is because eventually whatever decisions are taken against Sri Lanka end up not affecting the leaders, the opposition or any others in power but the ordinary citizens and the brave ranaviruwo who will end up suffering no different to how the people of Kosovo, Iraq, Afghanistan, Haiti, Libya and even Egypt. 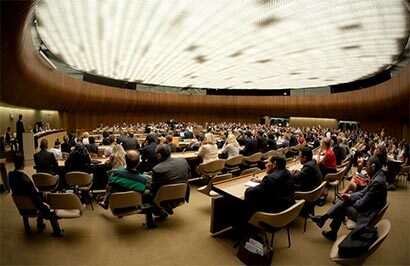 With each passing day as we near another Geneva session the people continue to wonder exactly what the strategy is and how prepared Sri Lanka is to take on the allegations which we are well aware are not without background reasons and have nothing to do with what happened during the war leave alone the last stages of the war. It is with this reality that it is time we realized that we cannot negotiate with the barrage of accusations unless we have people competent to take on the arguments with the legal experience nurtured from the floors of a courtroom – we need legal luminaries who can argue cases and win them. Not grovel before our enemy who is accusing us without having evidence to substantiate claims of allegations. We need people like Mr. S L Gunasekera, Mr. Gomin Dayasri, Mr. Manohara de Silva to defend our cause for not only do they have the experience they are passionate and patriotic people worthy of taking up the challenge. People can be mesmerized by Oxbridge English but in Geneva we are not sending representatives to bring back marks scored for the quality of English spoken. What good has Oxbridge language been when Anton Balasingham managed to win every debate held over the present Foreign Minister ridiculing Sri Lanka’s defenses further leaving him to simply agree to everything that was being placed across the table. We cannot afford to have people with one foot here and another foot there who are singing for their supper but not which the Government serves. There are plenty of human rights charlatans who would have been throwing dinner parties in celebration of the humiliation by Cameron for they are all surviving because of funds that keep them alive – they have no patriotism towards the nation except to function to the dictates of their pay masters. The litmus test on the allegiance to the nation was tested during the CHOGM when British premier descended after meetings with Global Tamil forum leaders securing necessary backing for Conservative election campaign and ridiculed the country which was diplomatically unacceptable and unpardonable for any world leader. Young lawyer Dharshan Weerasekera recently exposed the shoddy preparation of the foreign ministry in the manner it defended the allegations being made and readers of the article felt disappointed at the manner that we have failed and we continue to repeatedly fail despite the Defense Secretary and his Ministry doing magnanimous work throughout the nation in virtually all areas that Ministers, Ministries and officials have failed. When Cameron embarrassed Sri Lanka as he did not a single official came out in defense of the country or its leader. They simply stood silent and did not utter a word in defense and the person who should have used his English which is his only qualification to remain in the portfolio has not uttered a word still. It was left to the President with the English he knew to say that ‘people in glass houses should not throw stones’ while the Defense Secretary in his inimitable fashion said what he had to say and no foreign leader would dare mess around with the Defense Secretary because he has built a reputation for his no nonsense attitude and this is what we expect of the officials representing us at foreign forums. When they do not have a reputation or the reputation they have is appeasement it is why these foreign leaders and their representatives have managed to push various Commissions and stratagems indirectly meant to tie the noose round the leaders and ultimately bind the leaders legally and to crucify the country altogether. The people must realize that none of these Commissions are really to serve the Sinhalese, Tamils, Muslims, Buddhists, Hindus, Christians or Muslims. Why has it been difficult to say that Sri Lanka defeated Terrorists and not Tamils and question on what grounds Sri Lanka should adopt or design Reconciliation programs? In the same vein Sri Lanka should also prove how the Allies applied denazification and treated the German citizens equaling them all as Nazis and how many Germans were killed by Allied post-War policy. Sri Lanka should be able to showcase how Sri Lanka despite its debt ridden status taking USD3billion loans have uplifted the lives of the Tamils of the North. Why cant Sri Lanka demand proof of what grievances that only Tamils suffer from which are not shared by Sinhalese or Muslims? Why has it been difficult to argue that we do not need punitive or restitute justice and we just need to be allowed to manage post-conflict without busy body nations pocking their noses into internal affairs for they do not like other nations meddling with theirs? Why has it been difficult for our officials to argue that it is totally immoral to be investigating a last phase when over 30 years the LTTE targeted and killed civilians – the last phase was in a climate of war and the LTTE were not only given amnesty’s to give up arms and surrender but the LTTE went on to claim that all of those who were with them would die with them fighting for their cause. We should be quoting the legal provisions for when civilians lose their civilian status if they are involved in combat. There is enough of legal jargon to be used to defend the nation – we want to know why it has not been used by those representing us? 1. Colonial Crimes – for reconciliation must start with the invasion and forceful occupation of our nation, the crimes against humanity to our people, the animals and our land, the policies by colonial rulers that were to exterminate the majority populace, these historical injustices are yet to be rectified and why do they not constitute reconciliation norms? Why have the historical injustices to the Sinhala Buddhist never been addressed? why have the temple lands taken over by the Church between 1505 to 1948 being surveyed and historical and archeological sites of the Western province in particular taken into account? Why are the colonial crimes and reparation for centuries of oppression not included in the justice and reconciliation system? 2. LLRC shortcomings – The LLRC attempted to connect the 30 year conflict to the outcome of the 1956 language policy and chose to totally discount the views of the nationalists? Why have ALL the submissions of the nationalists been omitted and not even a mention or reference of the submissions made by them included in the final report. It is now time that ALL these submissions were published in book form to the public to reveal the extent of detail that LLRC has purposely omitted and strengthens the case that it does not carry the full view of the entire polity. Even with regard to language policy why has it been difficult to ask all citizens to learn Sinhala for that is the majority language – why should everyone learn only Tamil? Do the English require that everyone learn Welsh? When Sinhalese is the official language is it not mandatory for everyone to know Sinhalese? 3. LTTE cadres on trial – it is also noteworthy that it is now time that the remaining LTTE cadres who have failed rehabilitation to be tried in court of law for their criminal acts against the Sri Lankan state and the people. We also need to continuously showcase the magnanimous gesture by the Sri Lankan President to offer a Presidential pardon to all the LTTE child soldiers – all of whom are now leading normal lives with their families. No other country with child soldiers has treated children as victims as Sri Lanka has. These areas need to be showcased internationally by all missions and regularly the foreign missions must have a monthly agenda with the same topic to showcase to the public and officials of the nations they are serving in. This way there is public awareness built across the world at the same time. 4. Demand ban on LTTE fronts operating overseas – foreign governments must be made to realize it is through the illegally acquired money generated from their citizens that the LTTE fronts are operating – the foreign missions must regularly showcase these illegal activities and make the general public of these nations aware so that they would ensure their Governments do something about investigating and take legal action against fundraising for terror. 5. Grievances of ALL – cannot exclude the Sinhalese and Muslims throughout the terror reign of the LTTE. This is a mistake the officials continue to make without publicly declaring that rights of Tamils cannot supersede the rights of Sinhalese and Muslims and they had suffered equally. None of the campaigns that the Government has embarked on gets anywhere and gives the necessary dividends because they do not take place with passion and coherently with all missions steering these initiatives at the same time so that globally a shift of perception can be brought about. Isolated cases of interview success by officials leads nowhere near the end objective of defending the nation. It is without a doubt that Sri Lanka’s victory over terrorism is envied by a lot of nations most of all those that had been propping up the LTTE over the years as well as those who had been living off the nations supporting LTTE and advancing regime change and ideological changes inside Sri Lanka which are taking shape subtly since the attention of the Government is kept fire fighting an assortment of cases which are now seeing a rise and well timed ahead of Geneva obviously to pressurize the Government on all fronts. As for the warnings and advise given to the Government regarding the type of officials that it should trust with representing the country – it comes from sources who are neither funded to say what they say or those trying to usurp the Government but those who are patriotic about the country, its people and most of all those who regard with the highest of respect the sacrifices made by the ranaviruwan towards freeing the nation of the menace of terrorism and LTTE terrorists. It is these credentials that must warrant the Government and leaders to take stock of the warnings and prepare our defense for Geneva 2014.